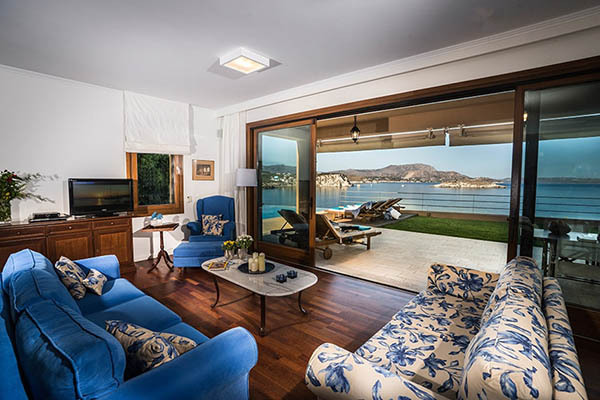 Poised above the Aegean Sea, SK Place Crete Luxury Seafront Villas offer plenty of life’s luxuries combined with breath-taking panoramic sea and mountain scenery of the White Mountains. The magical location of this resort in West Crete is where treasured memories are made. 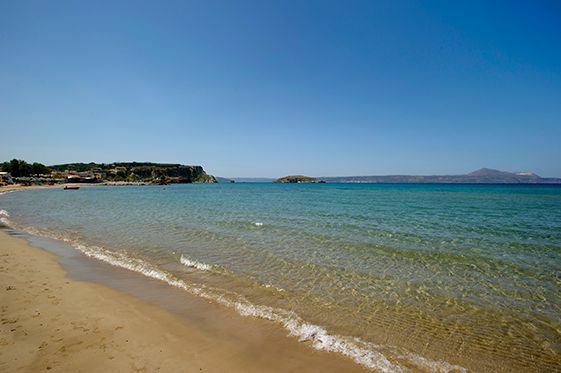 Oozing charm and a relaxing atmosphere, surrender your senses and experience the delight of fresh clean sea water, invigorating warm sunshine, imposing mountain views and soft golden sand. SK Place Crete Luxury Seafront Villas is the place where dream holidays come true. From the intimate atmosphere to the luxurious surroundings brimming with character and charm, we have thought of everything to make your stay unforgettable. The wonderful atmosphere of deepest light blue, blissful sunsets and magical starry skies create the perfect scene for escaping everyday routine. Re-discover the joy of pure relaxation in unparalleled comfort and space in each of our exquisitely designed luxury villas in Crete. Each luxury villa with pool reflects a different architectural approach with either traditional Cretan (Villa Anemos), island style (Villa Ammos) or modern – minimal (Almyra Residence) characteristics. 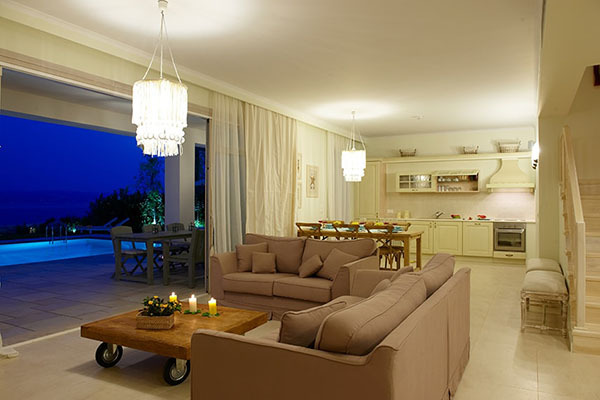 The stylish interior décor of each villa combines simple elegance with subtle accents of comfort and luxury. These fabulous architecturally designed and built three-bedroom holidays villas in Chania are the work of the Owner/Architect Pavlos Papadakis. 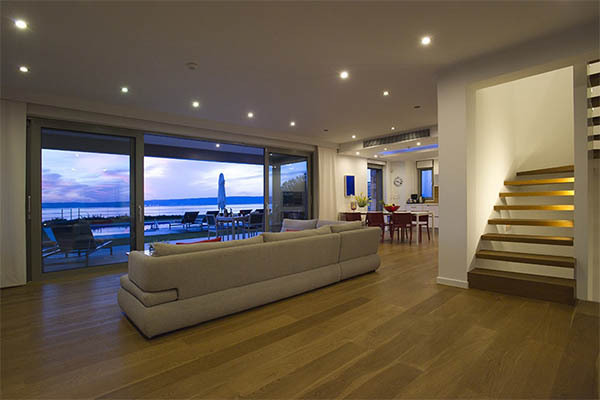 An architectural masterpiece of minimalistic design, this luxury villa boasts breath-taking panoramic sea and mountain views. The ultimate island-style luxury in aesthetic fusion of Greek character provides the highest standards in modern comfort and style. Featuring an infinity pool, this villa offers a unique atmosphere of unparalleled Cretan architecture and modern luxury. All your wishes come true at once! This place is the first one in all our years of travelling around Europe that has ticked all our boxes. The villas are in a very safe and very well looked after enclosed compound - close enough to the lovely beach and resort for restaurants and facilities, but outside enough to avoid noise, traffic etc - they offer privacy from each other, are very spacious, beautifully decorated (we stayed in Ammos), have everything you may need for your stay, from 1st aid kit, to incense burners and candles to keep mosquitoes away in the evenings. A perfect little paradise - wonderful setting for a wedding! We got married at SK Place on 27th May in Villa Anemos. We hired all three villas and Katerina was our wedding planner extraordinaire and she was wonderful. It was a magical setting for our intimate occasion and the day was absolutely perfect. We stayed a total of 2 weeks and were lucky enough to stay in all 3 Villas, each has its own special something and each one we loved, but you cannot beat the sunsets at Villa Anemos, wow, absolutely spectacular. Katerina is extremely warm and welcoming and cannot be more helpful and attentive. We were all welcomed with open arms and our children fellin love with the place and the wonderful people, Katerina, Lilly and Maria were fabulous with them and made us all so at home. I cannot recommend these villas enough, our wedding day was spectacular and SK Place will forever be with us in the memories we have to keep forever. Its a place you have to see to believe... A special little paradise! The other reviews have said it all. We've travelled the world and not even the best 5+ star comes close to SK Place. But what no one has mentioned is the fabulous walking and hiking. Katerina provided us with great advice on where to find the best hikes. Trust her, she knows from experience. We stayed in the Almyra villa from May 5 to June 15 and in those 6 weeks walked / hiked approximately 400 km. Every day we walked at least 8 km and some days up to 20 km. Katerina provided us with easy to follow guide/map books. The routes took us off the main roads and followed dirt paths, donkey trails and gravel roads. We met locals along the way and enjoyed eating at tavernas in small villages. Most of the routes were loops that took approximately 3 hours. We'd start in the morning and finish up just after lunch. Some of the hikes were more challenging (the Imbros Gorge, recommended by Katerina was incredible, we used our hiking poles for this one).